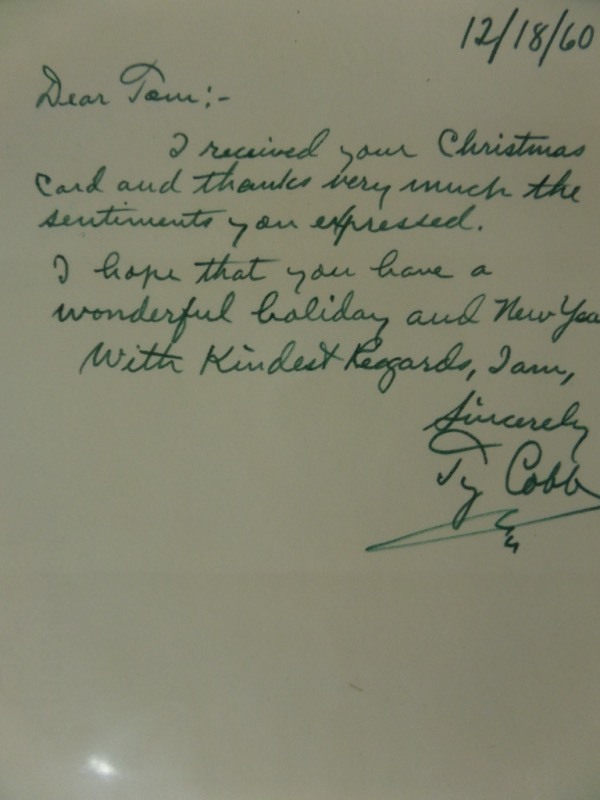 Coach's Corner - Ty Cobb Tigers hand written & signed personal letter. Go Back to Lot List Ty Cobb Tigers hand written & signed personal letter. This original, dated, one of a kind is a must have and a must frame piece from the long gone "Georgia Peach" and is dated in his own hand from 1960. It was written by him, signed at the bottom in bold green flair, and grades as nice as the day it was written. It is a Christmas wish and sentiment, and 6 lines long. It is a super cool attic find, and even though value is 2 grand, it is sold here at, or above this starting bid price.